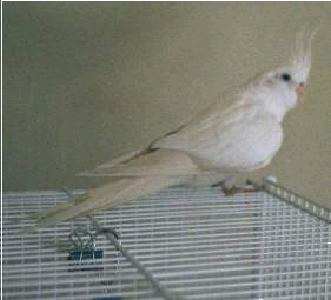 Albino: The Albino cockatiel is pure white with red eyes. It is really a double mutation consisting of Lutino, which prevents melanin from depositing in the plumage, and Whiteface, which prevents the lipochrome pigments from depositing in the plumage. 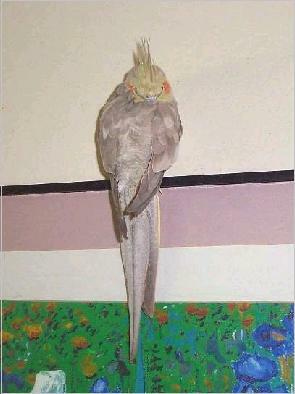 Cinnamon: The Cinnamon cockatiel is a mutation which causes the feathers which are normally grey to appear brown. The plumage color can range from a tannish-grey to a chocolate brown. Cinnamon-Pearl: A double mutation with the coloration of a Cinnamon and the feather pattern of Pearl. The female Cinnamon-Pearl often matures with a yellow face. The male will lose most or all of his pearling by the second molt. 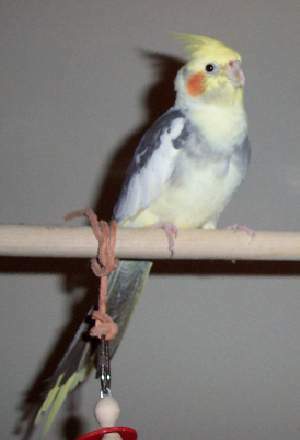 Cinnamon-Pearl-Pied: This triple mutation cockatiel has the coloration of a Cinnamon with the feather patterns of both a Pied and a Pearl. Cinnamon-Pearl-Whiteface: This triple mutation cockatiel is a combination of Cinnamon and Whiteface, which alter the coloration of the plumage, and Pearl, which alters the feather pattern. The brown of the Cinnamon becomes almost silver with the removal of lipochrome pigmentation, caused by the addition of Whiteface. 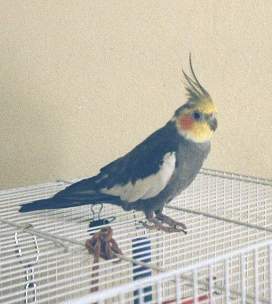 Fallow: The Fallow cockatiel has a very similar coloration to that of the Cinnamon cockatiel, but with a slightly diluted depth of color. The fallow has red eyes, a pink beak, and pink feet. 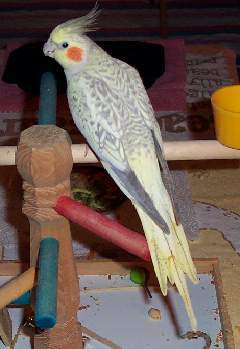 Normal Grey: The male normal grey, shown here, has dark grey feathers over his entire body, excluding the white wing bars, yellow face, and bright orange cheekpatches. 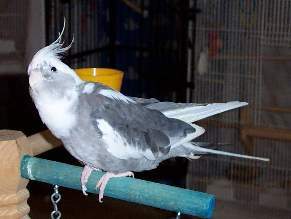 If you see a few white or yellow feathers on the back of a normal grey cockatiel's neck and head, it means that the cockatiel is carrying one gene for the recessive mutation Pied (see below). Lutino: Lutino cockatiels can range from all yellow to all white; one thing they have in common is both sexes have a bright orange cheekpatch. Some Lutinos have bright red eyes, but most have maroon colored eyes upon maturity. Pearl: The female Pearl will show heavy pearling on her back and wings with some pearling on her chest and often matures with a yellow face. The male will normally lose most or all of his pearling by the second molt. Pied: An excellent specimen will have symmetrical markings, preferably in a 70% Pied to 30% melanin (in this case gray) ratio. The Pied portion of the plumage can range from yellow to white. Silver-Whiteface: Dominant Silver is a two factored mutation. The single factor which alters the coloration of the plumage, along with the addition of the Whiteface mutation, which removes the lipochrome (or yellow and orange) pigmentation. 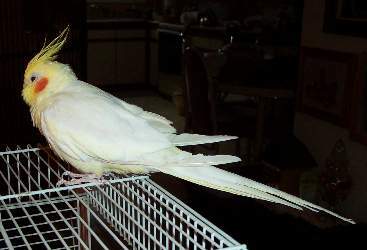 Whiteface: The Whiteface cockatiel, shown here, is a strikingly beautiful bird with its charcoal colored feathers and white face. cockatielrescuecorp@gmail.com 1212 Saint Elizabeth Ct.